When I was a boy, I had two heroes. They were both Southern Baptist ministers. The first was my father. The second was Billy Graham. For the first 18 years of my life, I heard my father preach three times a week – on Sunday mornings, Sunday evenings, and during Wednesday night prayer meetings. 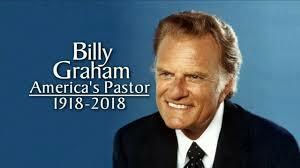 I heard Billy Graham preach once a week, on Sunday evenings on his “Hour of Power” radio show. My mother and father and I would listen to him in our kitchen while eating a late night supper after returning from our church’s Sunday evening services. Before my dad preached, our church choir would sing a hymn accompanied by my mother on the church piano. Before Billy Graham would preach, the great baritone singer George Beverly Shea would sing How Great Thou Art. At the end of my father’s sermons, there would be an altar call, and occasionally one or two people would walk down the aisle of the church, shake my father’s hand, and make a profession of faith in Jesus Christ. At the end of Billy Graham’s sermons, there would be an altar call to which literally hundreds of people would respond. At the altar call at our little church, our small choir would sing Just As I Am, the same song sung by Billy Graham’s large choir during the altar calls at his crusades. Billy Graham was a dynamic preacher whose messages inspired congregations throughout the world. My father was soft-spoken and more of a teacher than a preacher. His ministry was not so much inspirational as it was comforting. My father had what some theologians call a “ministry of presence,” and his “sermons” were often simply sitting beside and being with his brothers and sisters. My dad’s presence was a quiet prayer. In the aftermath of Billy Graham’s passing on Wednesday, I have thought a lot about both these heroes of my youth. It occurred to me that they were both the type of ministers we need on this side of Heaven...one who inspired us to repent and ask for forgiveness and seek salvation and redemption, and the other to show us, by example rather than words, God’s grace-filled love for each of us. I am so thankful that both of these men, in very different ways, were my ministers. Bart Haltom: Your Father, Uncle Bill, was one of the greatest men I ever met. I think of him often and remember his kind and humorous presence. He always made you feel special. He is truly missed! Tom Momberg: “My dad’s presence was a quiet prayer.” Bill, I knew neither Billy, but your simple summary reminded me of my own father. Thank you. Jack Greiner : It's pretty nice to have you on this side of heaven as well, Bill. Eyleen Farmer: Your lovely tribute stirred up lots of memories for me. I only met your dad once and Billy Graham not at all, but seems to me you channel them both in the good work you do. Thanks for sharing. Roy Herron: Amen, Brother Billy. Amen. Would that we had more of both. May we be brave enough to be more of both.